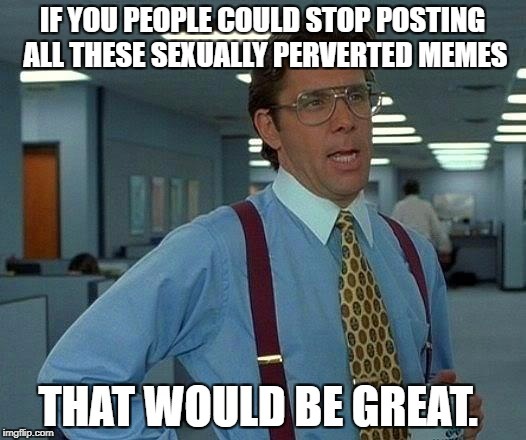 Check NSFW and stop looking at them then like a perv then. Jack - Where are your counter arguments? Missing in action? I'm still waiting for them.
" I'm not even reading your drivel. You keep referring to logical fallacies to verify your inane pablum yet still offer no FACTS nor even opinion applicable to the subject. " That ain't a counter argument, that's an instruction. Ye eye offendeth thee, poke that sucka out - God. What happened? Can't keep your commitments? Or am I inside your puny head? Jack - I have checked NSFW. I can't unsee what I already saw. Where are your counter arguments? Missing in action? 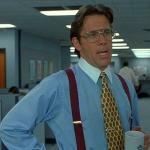 IF YOU PEOPLE COULD STOP POSTING ALL THESE SEXUALLY PERVERTED MEMES; THAT WOULD BE GREAT.